This is dinner tonight – my kitchen smells great! Heat olive oil in a large pot over a medium high heat. Cook onion for about 3 or 4 minutes until translucent. Add garlic and cook an additional minute. Add the Moroccan spice blend and stir well, coating the onions and garlic in the spices. Cook for 1 minute. Pour in tomatoes and water and bring to a boil. Add cauliflower and lentils and bring to a boil again. Turn down to a simmer and cook covered for another 15-20 minutes until the cauliflower is softened. 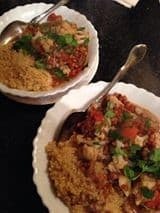 Serve with fresh coriander as a side or over rice or couscous.